Pickering emulsions are stabilized by solid particles. 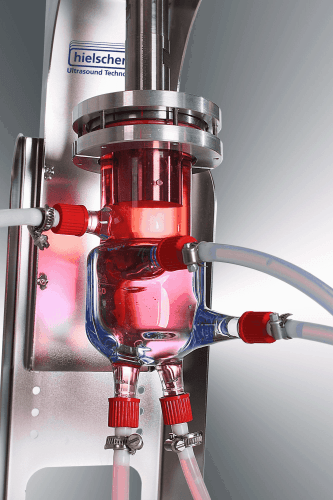 Pickering emulsions convince by their “emulsifier-free” character and their enhanced stability. 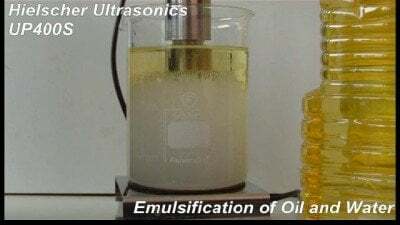 Ultrasonic is the perfect tool to create Pickering emulsions by firstly dispersing the stabilizing particles into the water phase and secondly to emulsify the oil/water phase. Pickering emulsions are stabilized by adsorbed solid particles instead of an emulsifier or surfactant. Thereby, Pickering emulsions can be considered as “emulsifier-free” or “surfactant-free” since they are stabilized by solid particles. If oil and water are mixed and small oil droplets are formed and dispersed throughout the water, eventually the droplets will coalesce to decrease the amount of energy in the system. However, if solid particles are added to the mixture, they will bind to the surface of the interface and prevent the droplets from coalescing, thus causing the emulsion to be more stable. The formation without emulsifier is especially interesting for the formulation of products for which the use of surfactants have negative effects, e.g. for pharmaceutical and cosmetic products. Furthermore, Pickering emulsions show an enhanced stability in comparison to emulsions that are stabilized by conventional emulsifiers. The droplet coating of solid particles functions as a rigid barrier against coalescence. This means that even highly concentrated emulsions can be efficiently stabilized as Pickering emulsions. The solid nanoparticles, which are adsorbed between the oil–water interface, are partly immersed in water and oil medium, so that the stabilizing nanoparticles can have hydrophilic, hydrophobic or amphiphilic properties. Particle shape and particle size effect the stability of the emulsion, too. The high mechanical shear forces of ultrasonic homogenization overcome the energy barrier between the phase interfaces. Furthermore, sonication breaks the aggregates and agglomerates of nanoparticles and creates a highly polydisperse emulsion. 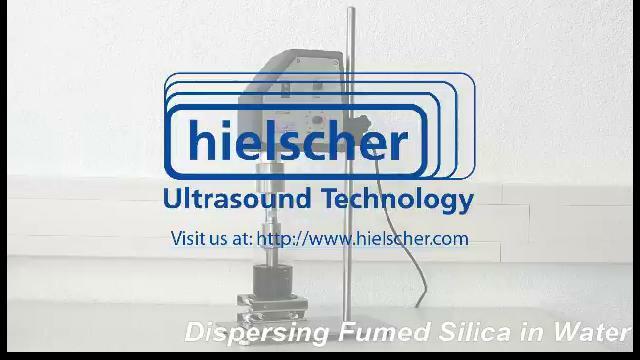 At first, hydrophilic fumed silica powders (such as Aerosil® 200 or Aerosil® 380) was dispersed as 100nm agglomerates into water using an ultrasonic device. At the second step, a stable o/w emulsions with 20 wt% of oil and 2–10nm diameter droplet size were prepared by sonication. To obtain stable, transparent emulsions of butanol, ethyl acetate, butyl lactate, and diethyl adipate in the aqueous phase 6% of silica was required. For diisobutyl adipate at least 8% silica are required to obtain a stable emulsion. All prepared emulsions have shown to be stable for at least 6 months. Whilst bare as well as functionalized silica (SiO2) is one of the most commonly used particle, other particles such as Fe3O4, hydroxyapatite, monodisperse polystyrene latex particles, halloysite nanotubes, hematite (α-Fe2O3) microparticles, poly(methyl methacrylate) (PMMA), insoluble chitosan/gelatin-B complex particles etc. have been successfully used to create stable Pickering emulsions. Oil-in-water Pickering emulsion refers to an emulsion where droplets of oil are dispersed in water as the continuous phase. This type of Pickering emulsions is generally stabilized by nano particles whose contact angle is less than 90º. o/w Pickering emulsions can be stabilized e.g. by the use of fumed silica, Fe3O4 nano particles. The oils phase of those Pickering emulsions can consist e.g. in dodecane, octadecenyl succinic anhydride (ODSA), toluene and butyl butyrate in water, respectively. Water-in-oil Pickering emulsions contain droplets of water as the dispersed phase and oil as the continuous phase. Nano particles with contact angle greater than 90º are the best stabilizing agents for these types of emulsions. o/w Pickering emulsions can be stabilized by the use of magnetic nano particles. Double or multiple Pickering emulsions (w/o/w or o/w/o) are complex polydisperse systems where tiny droplets are suspended within bigger droplets that are furthermore suspended in a continuous phase. For multiple Pickering emulsions, a two step emulsification process is carried out: For a w/o/w emulsion, in the first emulsification step, the w/o emulsion is stabilized by hydrophobic nanoparticles; in the second emulsification step, hydrophilic nanoparticles are used as stabilizer. Multiple emulsions can be formed as water-in-oil-in-water (w/o/w) or oil-in-water-in-oil (o/w/o). w/o/w emulsions are frequently used as vehicles / carriers for various hydrophilic active compounds and drugs (e.g. vitamins, antioxidants, enzymes, vaccines, hormones), which are be then slowly released. As some active substances also migrate from the outer to the inner phase of a multiple emulsion, such w/o/w emulsions work perfectly for the retarded release / sustained release delivery of the active substances. A unique phenomenon occurring in some Pickering emulsion systems is droplet bridging. Colloids protruding from a droplet surface can simultaneously adsorb to another interface, bridging two droplets. The bridges consist of monolayers of colloidal particles and the droplets are only separated by a thin film of the continuous phase.